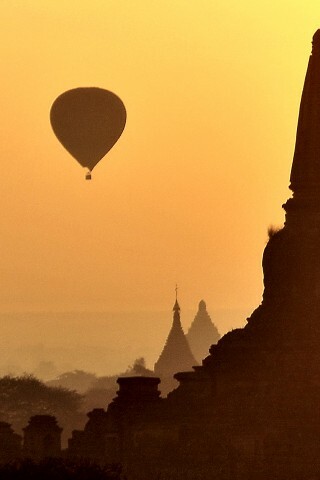 The popular hot air balloon trips over Bagan don’t come cheap, but that doesn’t stop them getting booked up well in advance during peak periods. Three companies offer the flights as of high season 2016/17: Balloons over Bagan, Golden Eagle and Oriental Ballooning. All seem to have similar rates of $380 per person for a premium package, while the two former operations also offer standard tours at a cheaper $320. Tours include return transfers to your hotel, breakfast, champagne on landing and certificate. The premium package includes in-flight photos and video too. Standard balloons carry up to 12 passengers, but the premium have a maximum of eight. Times vary slightly from month to month, with the flights timed to coincide with sunrise. Generally pick-up will be around 05:00-05:30 and you’ll be back between 07:00 and 07:30 after a flight of an hour or so. All three companies offer flights from October to March inclusive. Golden Eagle Ballooning: Office is in Umbra Hotel, Wet Kyi Inn; T: (092) 5208 4232, (092) 5208 4242; bookings@goldeneagleballooning.com; goldeneagleballooning.com/index.php. Balloons over Bagan: Thiri Pyisayar St 5, Nyaung U (near Zfreeti Hotel); T: (061) 60713, (094) 4804 5716; resmgr@balloonsoverbagan.com; www.balloonsoverbagan.com; open daily 09:00-20:00. Oriental Ballooning: Lanmadaw Rd, Nyaung U; T: (092) 5050 5383, (092) 5910 0511; www.orientalballooning.com; open daily 09:00-20:00. Last updated on 15th September, 2016.